The Bible is both a divine and a human book. It is the inspired word of God for his people, whether in biblical times or for the church today. It is also a fully human book, written by different people in a variety of cultural settings. Knowledge of biblical language and society is essential if the meaning of the human writer is to be grasped fully. The Apollos Old Testament Commentary aims to take with equal seriousness the divine and human aspects of Scripture. It expounds the books of the Old Testament in a scholarly manner accessible to nonexperts, and shows the relevance of the Old Testament to modern readers. 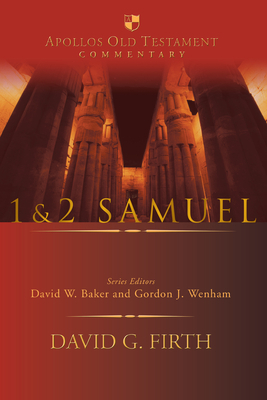 This commentary begins with an Introduction, which gives an overview of the issues of date, authorship, sources and so on, but which also outlines more fully than usual the theology of 1 & 2 Samuel, and provides pointers toward its interpretation and contemporary application. The annotated Translation of the Hebrew text by the author forms the basis for the subsequent commentary. The Form and Structure section examines the context of a passage, its use of rhetorical devices, and source and form-critical issues. The Comment section is a thorough, detailed exegesis of the historical and theological meaning of the passage. The Explanation--the goal of the commentary--offers a full exposition of the theological message within the framework of biblical theology, and a commitment to the inspiration and authority of the Old Testament. Written by an international team of scholars, the commentaries are intended primarily to serve the needs of those who preach from the Old Testament. They are equally suitable for use by scholars and all serious students of the Bible.